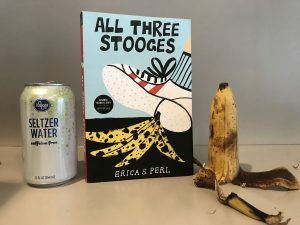 Erica Perl’s newest book All Three Stooges enters the world tomorrow. I had the pleasure of having the ARC and reading it a few weeks ago. 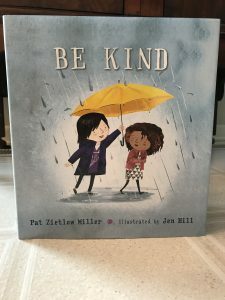 For the past several years, I think that middle grade/young adult authors have done such a wonderful job dealing with difficult issues so many kids are exposed to in their daily lives, ones that occur personally or that they might see on the news or social media. This book is no exception. All Three Stooges is told from the perspective of a boy named Noah. Noah loves hanging out with his best friend, Dash and Dash’s father. While hanging out together the three of them would perform and watch comedy bits together. Unfortunately, Dash’s dad dies suddenly and Noah has a difficult time dealing with his death. Throughout the book Noah is not only mourning the loss of Dash’s dad, but Dash has shut Noah out of his life. For Noah, someone who loves comedy and entertaining others with his jokes, he finds it difficult to navigate his life without his best friend. In an honest way, Noah desperately wants his best friend back, and it leads to many poor decisions and having to really think about what is important in his life. With such a heavy theme, Erica has done a good job of weaving humor and pop culture references, which adds a good sense of lightness to the book. Also, within the book, Erica, educates the reader about the Three Stooges and other famous comedians. Within the first page it asks you to google the Three Stooges scene “seltzer fight three little pigskins.” (You should, it is pretty funny). After I finished the book I wrote Erica and told her I felt the book was heavy, emotional, funny, and made me think. There are probably so many students who loose a loved one in middle school and don’t know how to navigate their feelings. I know this book will touch the lives of many who read it. Thank you Erica for writing a book that deals with such a touchy topic in an enjoyable and heartfelt way. Erica was also kind enough to answer three questions about the book and three questions about her. Three words? That’s hard for someone as word-y as me, but I’ll try. First is loss, both because Dash loses his dad and Noah loses his best friend. The second word is longing, because Noah spend a lot of time wishing things could go back to the way they were (when Dash’s dad was alive and Dash was still speaking to him), and this motivates him to make some pretty bad choices. The third word is laughter. This is because it what cemented the friendship of Noah and Dash in the first place (their love of comedy), and because it is what keeps us going even in the toughest of times. What is one skit/sketch mentioned in the book that you would tell readers to google immediately and watch? In your author’s notes, you mentioned you wanted to tell this story from Noah’s perspective, had you ever drafted or considered from another point of view? Noah’s voice was the one that was in my head, and it helped me really focus on the ripple effect of a tragedy. I think this perspective also felt the closest to my own, since I have lost a friend to suicide and I am close to several people who have lost immediate family members to suicide. There are a lot of other things I like to do – dance, run, play with my kids and my dogs, bake pies, sing, and ski – but so far I’m not aware of any opportunities to become a singing, skiing, pie-baker. For this reason, I’m planning to stick with writing books! One of my favorite books is Roald Dahl’s DANNY THE CHAMPION OF THE WORLD. I didn’t consciously connect that book with ALL THREE STOOGES while I was writing it, but I think the way in which Danny worships his dad (but doesn’t know his secrets) is not unlike how Noah views Dash’s father, Gil. I wish I could say “seltzer!” because it plays an important role in this book, but the truth is: I’m trying to stop drinking carbonated beverages. I used to drink it every day but now I only have seltzer every once in a while, so it is not in my fridge. One of my favorite things, though, that IS in my fridge is a jar of capers. Tiny, pickled, salty little capers – yum! What do they tell you about me? That I love things that seem cute but pack a big punch. Like capers and hedgehogs (note: I don’t eat hedgehogs, or keep them in my fridge). Thank you Erica ! To learn more about Erica and all her other wonderful books, check out her website or follow her Instagram and twitter. There is a common phrase that many of us teach our children “You can’t judge a book by its cover”, but when it comes to books, it’s a different ball game. Book lovers, you know what I mean! How often do we pick up a novel based on the cover? This is exactly how we got introduced to Lindsey’s book Just Like Jackie. We saw the cover reveal on twitter and our jaws dropped. The illustration of a young girl and man in the cold snowy trees with just enough light poking through, we knew we had to read it! We were lucky enough to receive an ARC from a friend and we tapped right into it! Lindsey has created this wonderful main character, Robinson. When we first meet her she is beating up a boy in school who called her a name. Robinson has a hard exterior, but as we get to know her we learn that she is dealing with so much inside and like many kids, is trying to do her best to survive each day. As we read the book our heart ached for Robinson, who lives with her grandfather, and begins to notice that he is often forgetting things and having a hard time finishing sentences. She tries so hard to keep it a secret because he is all the family she has. 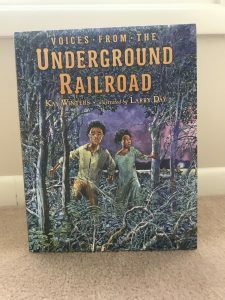 As we read it we were thinking how this book would really connect with many students, who outside of the school walls have so much going on in their home lives. It once again reminded us, as educators, that students have so many stories, many of which are never shared in classroom, but can effect their presence at school. 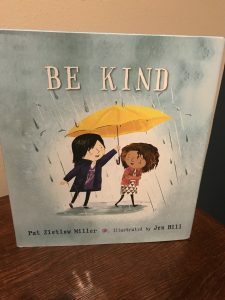 The book tackles themes of friendship, bullying, illness, loss of parent and more, the plot moved along well and we felt we got to grow with the characters. We hope you have a chance to read and get to know Robinson too. Lindsey was kind enough to answer 3 questions about the book and three questions about her. What three words you would use to describe Just Like Jackie? What was the process for creating this book with so many important themes? 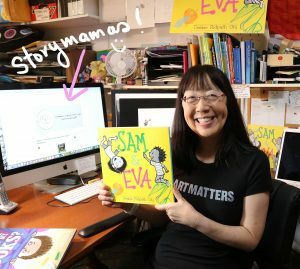 Whenever I write for kids I think back to my own middle grade years and try to focus in and really remember the things that made me feel something intensely. JUST LIKE JACKIE was born of the moments I recall sitting with my grandpa, when he would forget the ends of his sentences and I wouldn’t know for how long I should wait to see if he remembered, or if I should finish his sentence for him, or just nod and pat his hand as if to tell him that everything was going to be OK. I felt uncomfortable and sad and I wished I could do something to help his memory get better. This experience and these emotions helped me develop Robbie’s tender side, her relationship with her own grandpa. JUST LIKE JACKIE was also born from a feeling of rage when a neighborhood boy smashed a robins’ nest out of my backyard tree with his wiffle ball bat. I had been watching and waiting for those eggs to hatch into little birdies and when the blue shells splattered across my lawn my ten-year-old hands clenched and my fist connected with his face. This feeling helped me develop Robbie’s fiesty side, her anger with bully Alex Carter. From these two seed emotions, I was able to build the rest of Robbie’s story. Tell us about your experience with fixing cars and making maple syrup. When I was growing up, my dad worked for Toyota and my favorite part about visiting the dealership was the service shop out back. I was always amazed by the mechanics who knew how to assess a problem, hoist a car up on lifts, and fix it. I liked their dirty hands and oil-smeared uniforms. Unlike Robbie, I have never actually fixed anything on car in my life, but have always been in awe of people who have that technical know-how. Maple syrup is a different story. I definitely got my hands sticky with sap every sugaring season growing up in Vermont. My grandpa had a maple farm out in the woods with a thousand taps and holding tanks with old engines that would push the sap into the sugarhouse where we’d boil it down to our Stoddard family maple syrup. Like Robbie’s grandpa, mine also had Alzheimer’s, but out at his sugarhouse, flushing lines and chopping wood and boiling sap, he never missed a beat. I was a middle school English teacher in Washington Heights, NYC for ten years and LOVED it. 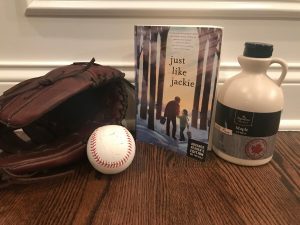 It was very hard to leave the classroom, but at the time of this two-book deal with HarperCollins, I also had my first child and returning to the classroom seemed like it would be too much. 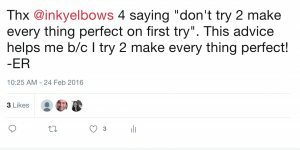 It felt like a good time to focus on my writing career in a way that I hadn’t been able to in the past because teachers work full FULL time. My husband and I are expecting a second child in February and I’ve just finished a second book, and my brain is churning on a third, but I hope to return to education, in some way, in the near future. Another dream of mine has always been to open an independent bookstore. I know it’s a lot of work and I’d have a lot to learn but I am SO HAPPY in bookstores. On the adult side, SING, UNBURIED, SING by Jesmyn Ward. This book gutted me. I had to put it down several times just to breathe. On the children’s side, BROWN GIRL DREAMING by Jacqueline Woodson. The story of her family is itself an incredible journey through American history, and her poetry both sings and pierces on every page. It’s unforgettable. Can I cheat and say my freezer? Because I’m never without at least one pint of Ben and Jerry’s ice cream. Chocolate Chip Cookie Dough, New York Super Fudge Chunk, Half Baked– I like the flavors with chunks, left on the counter until it’s just the right consistency, and eaten out of my Housing Works Bookstore mug. THAT, and a book, is my picture of comfort. Thank you Lindsey! To learn more about Lindsey, check out her website or follow her on twitter. 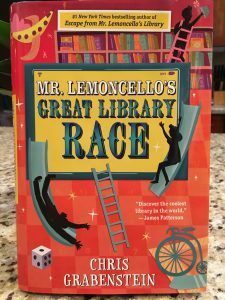 The book Mr. Lemoncello’s Great Library Race by Chris Grabenstein is the 3rd book in the Mr. Lemoncello series. It was a good book, but some parts of it might be hard to understand if you haven’t read the other 2 books. I was able to make many predictions that were close to accurate, but there was a big twist in the end. 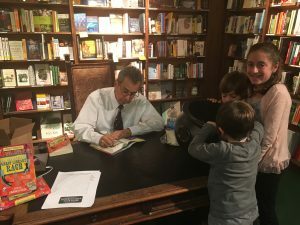 When I met the author, I realized that he was a lot like his character, Mr. Lemoncello. If you like puzzles, games, and reading, this is a book you should read. Hannah is currently a 5th grader, but was in my class as a third grader. When she was in my class she loved getting my recommendations of books to read. She only read one book at a time and put others on her “shelfie” (phrase we call our mental shelf of books we want to read). 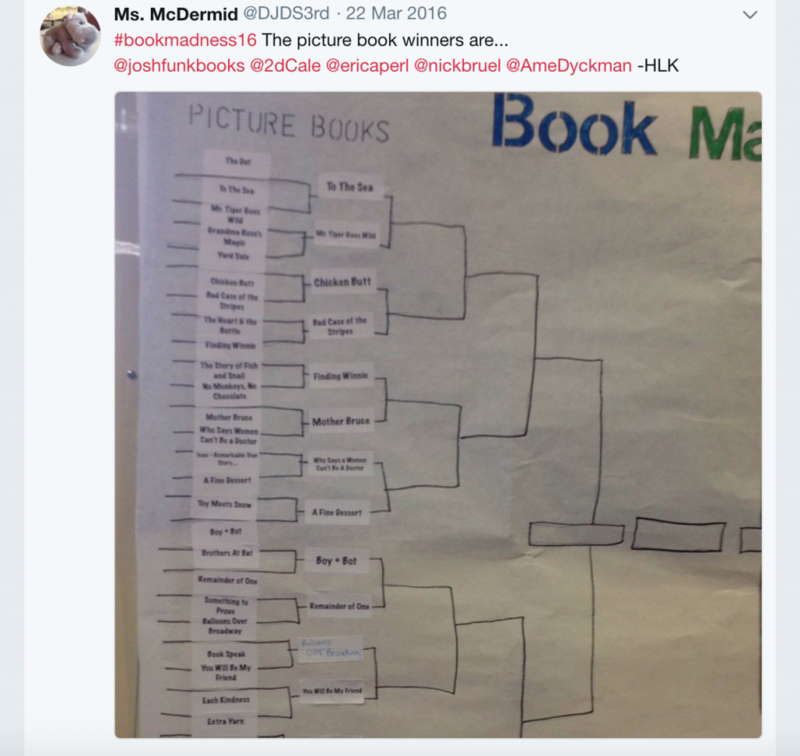 Hannah loved our #bookmadness16 tournament, reading all the nominated books (caught in the act on the tweet below). 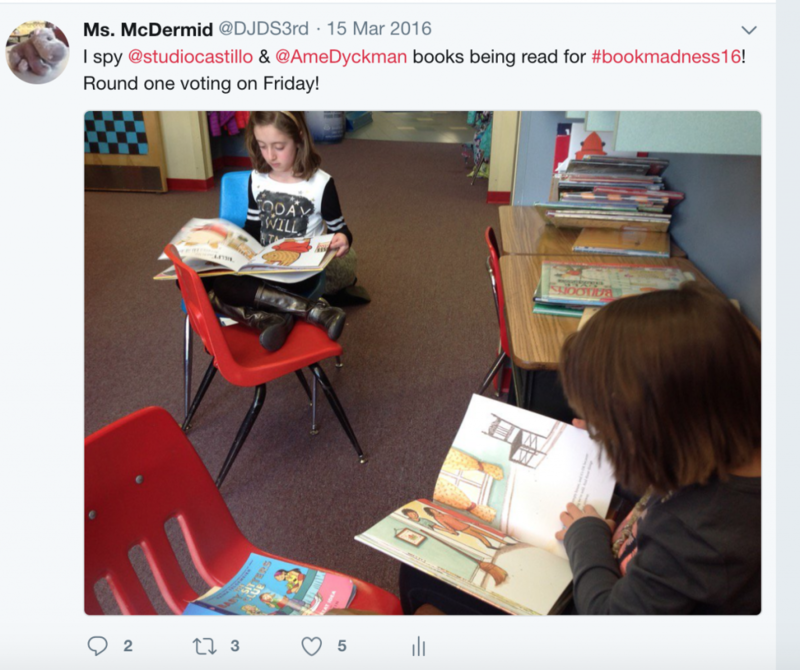 She often used our class twitter account to report out the winners of each round or to tweet to the nominated authors! I am so happy Hannah and I still keep in touch and talk about books. And I appreciate her taking the time to give us a kid review of a book (series) we have enjoyed! 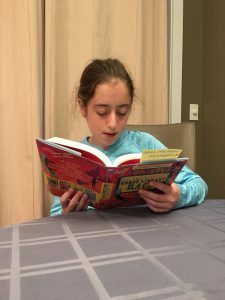 Hannah is a 5th grade student who loves to read, dance, ski, and hike. She is a great big sister and loves sleep away camp. 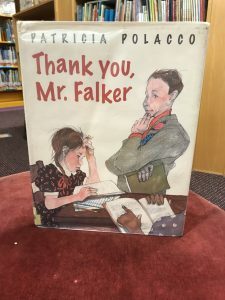 Last year I wrote a post about how I use Thank You Mr. Falker by Patricia Polacco in my classroom for a special Thanksgiving activity. Please take the time to read that post here. Today is also World Kindness Day and although I am currently staying home with my two boys for the year and don’t have a class to do this activity with, I decided to become my own student and show kindness to an old teacher. Last night I reread the book and then wrote a thank you letter to an old teacher in my life. I picked a woman who was my cooperating teacher for my student teaching in 2001! I have been in contact with her off and on through the years and decided I wanted her to be the recipient of a letter from me. I hope I hear back from her. Please keep your fingers crossed with me. 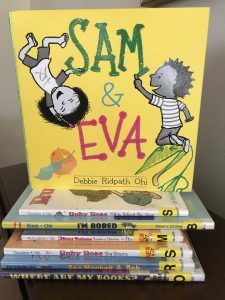 Another reason I want bring this book up is because I want to reiterate how important picture books can be for all ages. 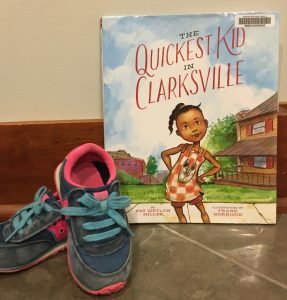 Right now there is a movement called #classroombookaday, which has many elementary, middle and even high school classes taking the time each day to read a picture book. I feel this book is the perfect #picturebooksformiddleschool! Published in 2012, it is a heart warming story about a bright girl, who has difficulty reading, finds comfort in drawing, and in 5th grade finally meets a teacher who helps her become a reader. Every time I read it I get tears in my eyes when she reencounters her teacher at the end. This is a great time to read it aloud in your classroom and have the students give thanks to the many teachers who have helped shaped who they are. Please leave a comment on how you’ve used this book or any other “giving thanks” favorites! What immediately struck us about Orchids is the beautiful, clear, crisp picture on the cover. We love how the entire book is dedicated to this one gorgeous flower. 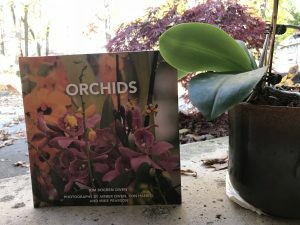 We see this book being a great resource for us as an introduction to the beautiful flower or if one of our kids wants to learn more in-depth information about orchids. The book is filled with wonderful facts about orchids, which are accompanied by bright photographs that support the text. 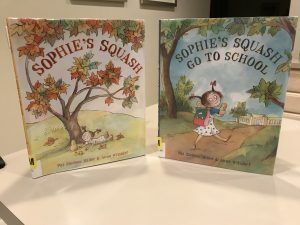 What we appreciated about the book is that it can be read and enjoyed by the smallest reader who wants to learn about shapes, colors and sizes. 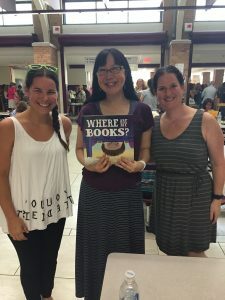 Kim does an amazing job of making connections for the reader from text to self and to the world. From the very first page she describes how orchids come in all shapes and sizes, just like people, and goes on to make a connection to orchids being symmetrical, just like our faces! She weaves interesting facts into the connections that children make to things they eat too. For example, how the vanilla orchid is pollinated by people and used in some of the most delicious foods we eat (oatmeal, cookies and ice cream). It is also wonderful for an older reader, possibly a budding botanist, with text that is also more complex and shows different ways an orchid affects our lives. 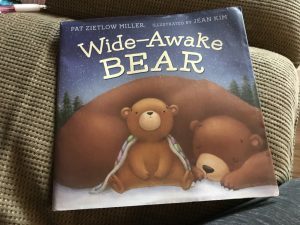 At the end of the book, Kim gives suggestions to extend learning, the ideas are geared more toward younger readers, involving different multi-sensory activities, but can be adapted for all ages. Orchids can be a wonderful book to start a conversation about flowers, nature, pollination, vocabulary, and the life cycle, or it can be a great reference to use to explore more about these flowers which make so many people happy! We only hope she has more of these beautiful nonfiction books in the works; we think this would make a wonderful series! Kim mixes art concepts and vocabulary with work of art by children. 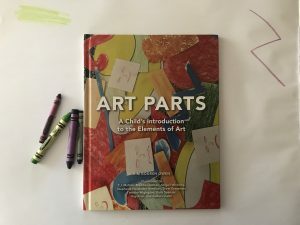 Art Part – A Child’s Introduction to Elements of Art is a useful guide for a young artist to learn that creating art can take on many shapes and forms. We like the wide range of art concept words ranging from concrete ideas to more abstract. After each page she provides a blank page for the reader to practice these concepts. We know sometimes it is hard to write in a book (even if it’s allowed), so when purchasing the book Kim allows you access to practice pages so you don’t have to write in the book or if you are working with more than one reader, you have multiple pages so there is no arguing (we love how she thought of that). We can see this book helping parents show their kids more ways to create art, but we also see it being useful in an art classroom. At the end of the book Kim writes ten ideas to further explore art and all the concepts learned in the book; a helpful guide for artists. As teachers and parents we would love to add an idea. The page where Kim discusses texture we would ask our children to go on a texture scavenger hunt and find the types of textures she describes: prickly, smooth, hard and soft and then glue in the artifacts they found so there is a tactile element to the texture page, similar to the touch-and-feel board books our babies love. Kim also runs wordsreflected.com a blog that gives parents and educators ideas on how to promote language and literacy with young children. You can connect with Kim on Twitter, Instagram or Facebook. Also, if you’d like to purchase either of these books. Please click this link.